I chose this picture because it's a game between the Eagles and Ravens, both of whom are the main subjects of this article. 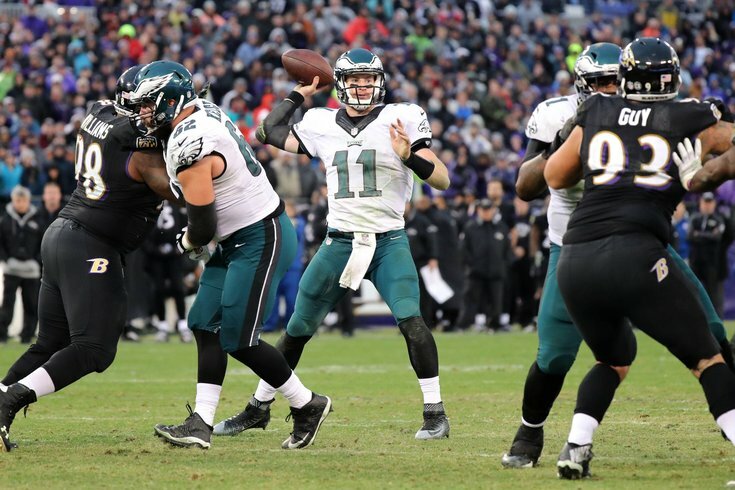 In Doug Pederson's hour-long media session at the NFL annual meetings in Phoenix on Tuesday, the one news item that came to light was that the Philadelphia Eagles will host the Baltimore Ravens for joint practices during 2019 training camp. "We’re going to go against Baltimore this year," Pederson said. "Week 3 of training camp. It’ll be in Philly." The Eagles and Ravens held joint practices in 2015 as well, when Chip Kelly was still the Eagles' head coach. The Eagles last held joint practices against the Miami Dolphins in 2017, but could not find a team to practice against in 2018. "Last year, it just didn’t work out, Pederson said. "We were trying to get a couple teams last year and scheduling just didn’t work out. We reached out to a couple teams this year, Baltimore being one. They’re right down the road. It’s simple for them; it’s easy for us. We’ll get a chance to play them. We had a great experience two years ago with the Dolphins coming and and we want to do it again." Week 3 of training camp starts to feel a little monotonous, and bringing in another team to practice with typically adds a little juice.